There are several note settings that can be customized for each service. 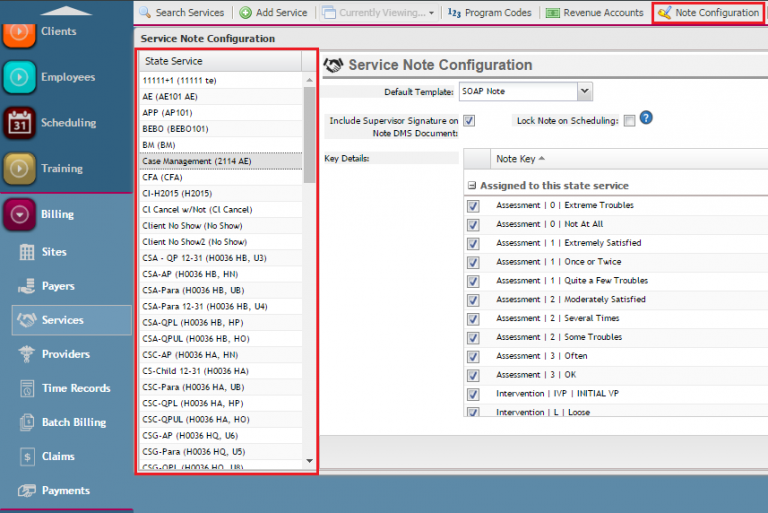 These can be managed in the Note configuration screen, which is found in the Services desktop. 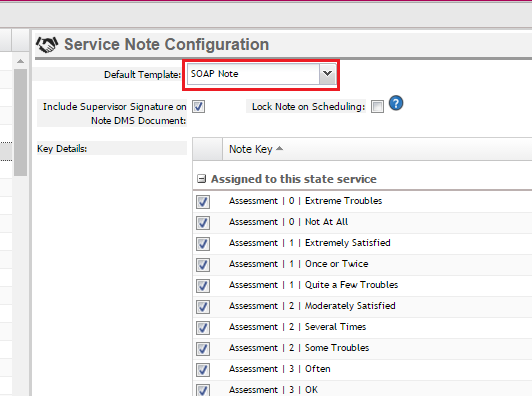 Here, signature and scheduling settings can be configured as well as the assignment of note keys per service for grid style notes. All of the services the agency provides should be listed along the left pane. Start by selecting a State Service. Next, it is recommended to select a Default Template. This will be the template that will be used to create the note by default each time the service is selected for note-writing. This is especially important to ensure that note-writers are documenting against the correct note format for each service they provide. Having the default setup is one less click when entering a note. Next, to include the supervisor signature on the completed note DMS document, select the “Include Supervisor Signature” checkbox. This places the supervisor who approved the note’s signature on the hard copy note format. If only one signature is required and that is the note-writers, then leave this blank. 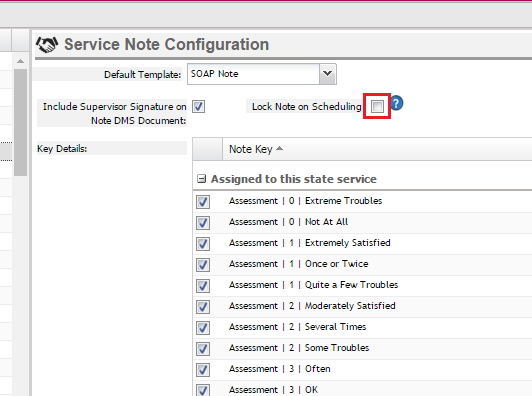 In order to make a scheduled event required for the creation of a note, select the “Lock Note on Scheduling” checkbox. This will ensure that notes can only be created using a schedule link. Note writers will still have the ability to manage start and end times on notes regardless of this setting, but all other billing specific components of the note such as caregiver, client, service and date will have to be entered on a schedule before the note can be written. This is highly recommended when there is a need to manage utilization of services tightly to ensure services are neither over nor under-utilized. This will require very effective management of the schedules so please be sure to understand the scheduler and that the services are entered on a schedule prior to checking here. Finally (for grid style notes) under Note Key, put a check in the checkboxes for any interventions and assessments that should be included on the note grid. 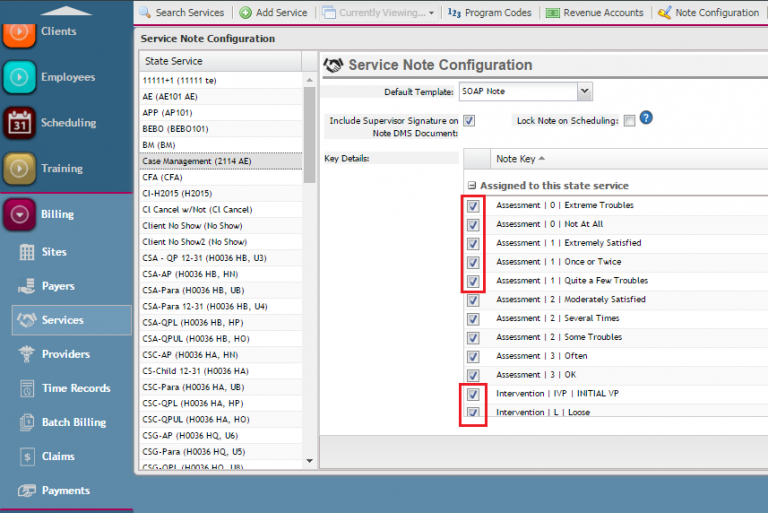 Once assigned, the corresponding note keys will show up under that service note. Please see the grid note videos to learn more. For related content, see the Note Templates and Note Keys articles and videos.